When constructing a URL in Launch Center Pro, you can insert special input tags in place of static text. When the action is executed, Launch Center Pro will prompt you for the content you wish to use (if needed), and insert it into the URL automatically. In 2.3.1, we introduced automatic input tag encoding. You should not need to worry about how a tag will be encoded in the vast majority of cases. If you run into problems, take a look at our 2.3.1 Release Notes for more information. Perhaps the most common input tag is [prompt]. At its most basic, a prompt can be inserted via the keyboard toolbar when editing an action. Hidden behind the simplicity of [prompt] are a few powerful attributes which can change the behavior of the prompt itself. By default, a prompt’s title will be set to the name of the action or app from which it was launched. In some cases, it may be useful to specify your own title – especially if you use multiple prompts in a single url. Optimized with special phone characters. Normal text layer, but the number layer is like numberpad instead of a usual keyboard. Limited to the valid email characters, with quick @ access, etc. For screenshots and more details about the various keyboard layouts, here’s a great post. 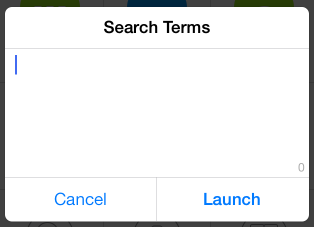 By default the bottom-right button is “Launch”. With this option, you will instead of a Return option which allows for line breaks. # You can specify a value different than the tile by using a "=". The contact picker allows you to choose an email or phone number from any contact in your address book, and the value is inserted into your URL. With the [clipboard] tag, any text on your clipboard will simply be inserted into the URL. Thanks to our friends at Giphy, Launch Center Pro can help you find that perfect animated GIF. When a [gif] tag is run, a GIF browser will be displayed. Simply pick a GIF, and a direct link will be inserted into your URL. [gif-id:giphyid]    # Allows for direct access to a GIF. You can find the ID on a GIF detail page. Place the ID of any action after a colon. The tag will expand at runtime and the corresponding url will be inserted into your URL. You will find an Action ID label at the bottom of every action’s Edit screen. You can tap the label to copy it to your clipboard. This is especially useful if you have a common follow-up action that you use for x-callback-url. There is no longer a need to go through each action to edit the x-success values… simply edit the source action and you’re done! To use TextExpander snippets, you must have the TextExpander iOS app installed. When run, it the expanded content will be inserted into the URL.